Hyder Alaska is about as unspoiled as Alaska is remote. Situated off the beaten path, this fun little town is a must visit for anyone driving British Columbia Highway 37 also known as the Cassiar Highway. 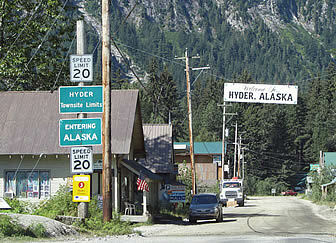 Driving up from the states the first opportunity to visit Alaska by car is in Hyder Alaska. Accessed via the Glacier Highway from the "T" in the road at Meziadin Junction, Hyder is the southern most town in Alaska that is accessible by road. Camp Run A Muck RV Park in downtown Hyder is really exceptional for the remoteness of the location. Rainey Creek Campground in Stewart British Columbia just across the border from Hyder; city run campground with some services. Stewart British Columbia and Hyder Alaska are neighboring towns separated by a common border. And yes, there is a border crossing to deal with so have your paperwork handy. Fish Creek Bear Viewing – Forest Service site with rangers and viewing platforms outside of Hyder, Alaska. From late July to September, a six mile drive north of Hyder on Salmon Glacier Road brings you to Fish Creek Wildlife Viewing Area. From here you will be able to see and photograph large brown and black bears as they feed on both pink and chum salmon that are spawning by the thousands in the creek below. It is said that Hyder offers some of the most accessible bear viewing in Alaska and I believe this may be true. for your convenience, the U.S. Forest Service maintains a viewing platform and boardwalk here and there are attendants here to oversee things during the summer bear viewing season. The most southern point in Alaska that you can drive to, Hyder Alaska is located at the head of the 130-mile long Portland Canal, Portland Canal is a deep water fjord which forms a portion of the border between the United States and the Canadian Province of British Columbia Canada. While located at the southeastern most portion of Alaska's Inside Passage the town is cut off from the rest of Alaska and can only be reached by boat or by crossing the border between Hyder and Stewart, British Columbia, only 2 miles away on the only road to town. Hyder is RV accessible from the Cassiar Highway via the Glacier Highway by taking the left turn at the “T” in the Cassiar Highway located at Mezadian Junction. Follow the Glacier Highway, British Columbia Highway 37A, usually called the Stewart Highway, 40 miles to the town of Stewart, British Columbia. which connects with the British Columbia highway system.yder is just 5 mles further down the road but be warned there is an Official U.S. Canadian Customs Crossing between the two towns.